The earliest recorded incumbent, in 1306 William was found guilty, with others, of robbing the chaplain of Frampton on Severn. In March 1540, Parsons, a former friar, was imprisoned in Gloucester Castle having been reported to Thomas Cromwell for 'ill preaching‘. He was sent to Windsor to be examined concerning heresy by the bishop of Salisbury, and was subsequently condemned to be burnt at the stake. John Foxe, in “Foxe’s Book of Martyrs” first published in 1563, records that upon being brought to the stake, Parsons asked for a drink which he drank to his fellow sufferers with the words, "Be merry, my brethren, and lift up your hearts to God; for after this sharp breakfast I trust we shall have a good dinner in the Kingdom of Christ, our Lord and Redeemer“. Hodde was a former monk of Cirencester Abbey. The curate serving the parish in 1576 was cited for failure to teach the catechism, preach sermons, or make perambulations, and he possessed neither Bible nor Testament - the churchwardens at that time had Puritan sympathies, objecting to the surplice, crossing at baptism, the use of the Magnificat and Nunc Dimittis, and to 'idolatry' in the church windows and on tombs. Parker was described as a sufficient scholar, but no preacher. 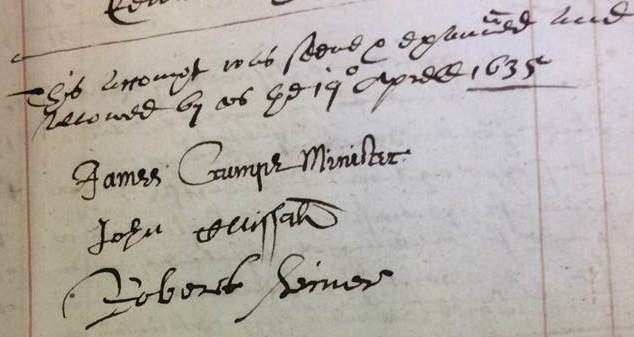 In 1574, a “Speciall Comyssion for Ecclesiasticall Causes” was set up for the dioceses of Gloucester and Bristol, and in 1581 it tried the case of a Thomas Greise, an unlicensed preacher who had counterfeited his testimonials from the University of Oxford, and forged a license to preach from the Bishop of Salisbury. While he was being kept prisoner in Gloucester Castle, it was ordered that, “a warrant be sent to Robert Hymdoner, the constable of Strowde, and Mr. Parker, curate there, for to serch for all such bookes as the saide Greise hath latelie had in his keepinge.” Greise was later banned from preaching, ministering or reading, and from teaching in any schools, and was expelled and banned for good from the dioceses of Gloucester and Bristol. In 1609, Woodwall published a sermon attacking the love of luxury among the rich, and complaining of the hardship caused to the poor by the activities of speculators in corn. Entries made in the churchwarden’s account book in 1623 records that one shilling was “pd. To Mr. Day for making a presentment”, and one shilling and sixpence was “pd. Mr. Day for making a wrighteing in prchement which was delivered into the registers office & for fees”. These payments refer to costs associated with transcribing the parish registers of births, deaths and marriages. These are known as Bishop’s Transcripts. 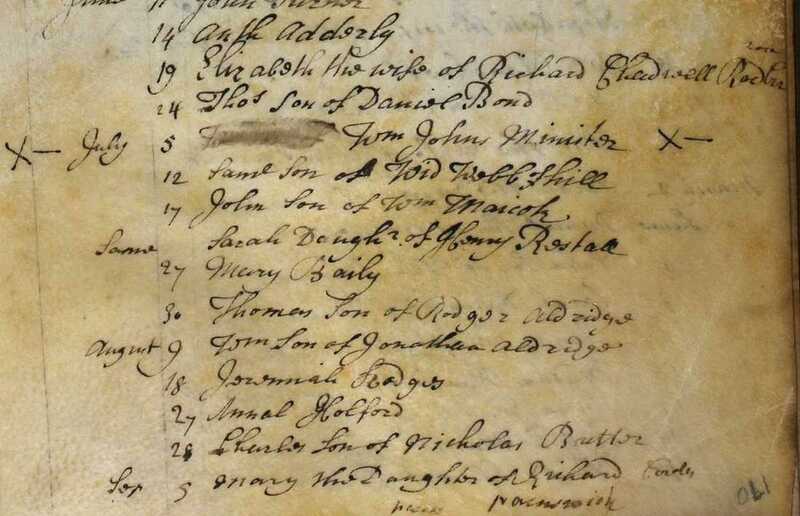 Later, an unnamed successor to Day (possibly a Walter Sweeper) found no entry of baptisms in the parish register after 8th September 1628, and therefore added a note of his own to the register, before his first entry on 6th September 1629, saying, “Anno dni 1629. Md. That frome the 8th daie of September above saide Mr. Day late minister tooke the record untoe September laste and soe dyed and the same was lost.” It appears that Day had been keeping loose notes of baptisms as they occurred, intending to enter them in one go at a future date, which his death had then perhaps prevented. Educated at Wadham College in Oxford, Crumpe was ordained as a deacon at St Giles’ in Oxford, in 1628. The churchwarden’s account book for the years 1629 and 1630 records several sums charged for “work done to Mr. Crumpe’s house and garden”; and in the accounts for 1632 there is an item of £1 10 shillings “Paid Mr. Crumpe for this yeare and the last yeare being due to him by Ancient Composition”. This was Crumpe’s annual stipend. Crumpe made his entries into the parish registers very carefully, and, unusually at that time, he subscribed his name into them at certain intervals: “Ita testor Ja: Crumpe Curatus de Stroud”, or “Curatus”. The churchwarden’s account book is in five places signed by Crumpe as “seen and allowed”. Two further references to Crumpe in the churchwarden’s account book record that 8 shillings was “(Paide) Mr. Crumpe for a church book”, and three shillings and eight pence was “Paide Mr. Crumpe expenses laid out at Court”. Crumpe’s last entry in the parish register was on 13th March 1642, and a later entry in the churchwarden’s account book states, “From 1645 to 1647, pd. Mr. Stephenson, Minister, his stipend”, amounting to 15 Shillings. It appears that Mr Stephenson succeeded James Crumpe, but was only curate for one year. Born in about 1604, Pleydell was educated at Magdalen Hall, Oxford. He is first mentioned in connection with St Laurence in the churchwarden’s account book in 1645, “ – for money layd out at newneham for theyr. Dyet passadge & horsemeat that went to Mr. Pleadell the minister” amounting to five shillings. The ‘passadge’ referred to was the fee for Pleydell being ferried across the River Severn from the parish of Arlingham, where he was probably living when appointed minister at Stroud, to the town of Newnham. In in about 1660, George Lord Coventry suddenly withheld an additional £10 which he and his predecessors had previously paid annually to the incumbent, and continued to withhold it for some years. 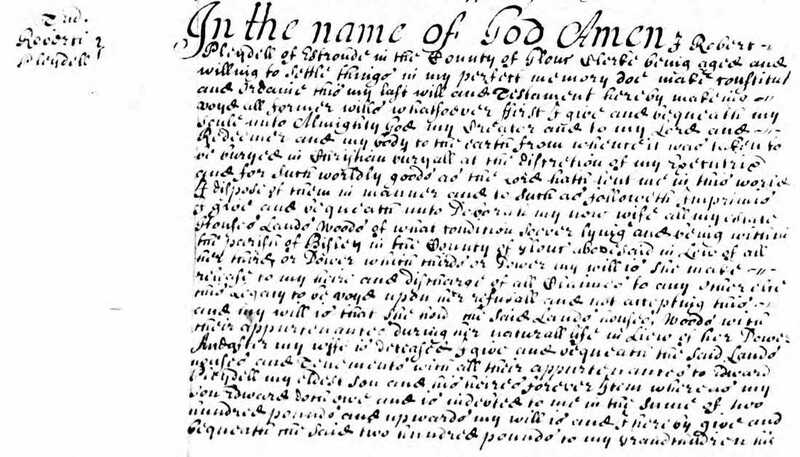 Eventually, in about 1668, Pleydell presented a petition to him, supported by John Stephens of Over (Upper) Lypiatt and other parishioners, urging resumption of the payment. Pleydell’s claim was based on “having very little more profit besides, for the supply of the place, save what arose out of the charitable contributions of the parishioners, for the maintenance and support of his wife and family.” In support of Pleydell, John Stephens added that Pleydell was “an honest man, an able, peaceable, orthodox minister, and no Presbyterian, as that term is used in opposition to Episcopal government”, and pointed out that the payment was a contractual obligation arising from the purchase of the rectory by the original Lord Keeper Coventry. The £10 annual payment was eventually restored. An entry in the churchwarden’s account book in 1670 recorded “Money collected in the Parish of Strowde for the redeemein of Christians out of slavery from the Turks, in the yeare of or. Lord god 1670: by Mr. Robert Pleydoll minister, and Thomas Ridler and Samuell Bubb Churchwardens.” Then follows the names of 143 contributors, totalling £3 14s 4d between them. At that time, the Corsairs of Barbary (the Barbary Pirates) operating out of North Africa (particularly Algiers, Tunis and Tripoli), were making slaves of sailors and others whom they took as prisoners of their piratical expeditions at sea. ​​Robert Pleydell died on 4th November 1679, at the age of 75, having been minister at St Laurence for 33 years, and was buried at the church. Owen was educated at Hart Hall in Oxford, and was ordained at Gloucester Cathedral in 1686, at the same time obtaining a licence from Dr Frampton, the then bishop, to the curacy at St Laurence. This prompted the first mention of Stroud or any of its curates in the register of the diocese of Gloucester: “November 16, 1686. Ego Franciscus Owen, A.M., nunc licentiandus et admittendus ad inserviendum curiae ecclesiae parochialis de Strowd, in diocese Gloucesteriensi, omnibus Articulis subscribe.” “Fiat licentia.” ["November 16, 1686. 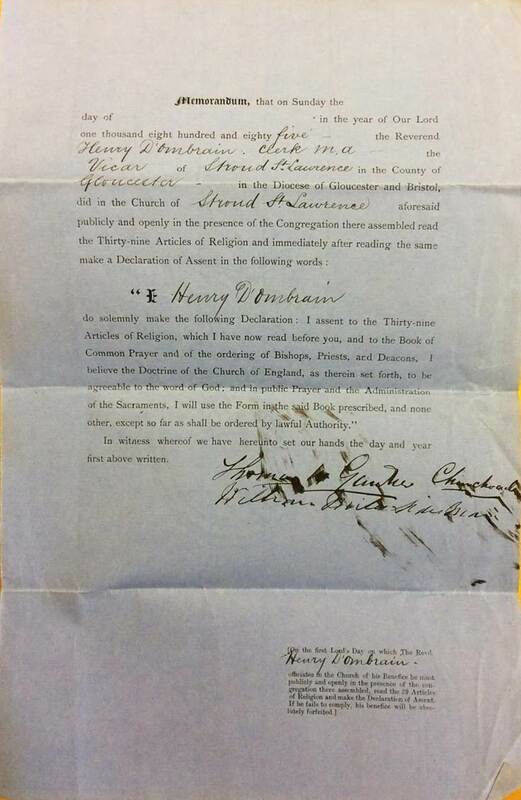 I, Francis Owen, AM, now be admitted to the service of the court of the church, and the licence of the parish of Strowde, in the diocese of Gloucester, subscribe to all the articles." "Let there be a licence.“] But the appointment was not without controversy, as the parish had always claimed the right of appointment to the position for itself. At that time the minister’s salary was very small, and with additional voluntary contributions from the parishioners being withheld from Owen, probably because of the manner in which he obtained his licence, he resigned the curacy before two years were up and became vicar at Northleach. Johns was nominated by the parishioners and licensed by the bishop to the curacy of St Laurence in 1688. For many years he occupied a house near The Cross, and in 1689 £22 10s 3d was spent on repairing it and fitting it out for him. In 1698, the lease of the Market House (now the Old Town Hall) was assigned to him for 21 years (that is, up to 1719) rent-free in consideration of his repairing of the property. Johns was said to be a public-spirited man who established several charity schools in the parish from 1700, and just before his death in 1721 he bequeathed his own house in Stroud called The Knapp, on the north side of Nelson Street, in trust to the treasurer of the Charity Society for teaching poor children yearly (20 shillings), for keeping in repair the pump at The Cross (10 shillings), for ringing the bell at 8 o’clock at night and 4 in the morning (10 shillings), for keeping in order the clock and chimes (£1), and any surplus of rents for putting poor children in apprenticeships. This trust for putting poor children in apprenticeships was to become a large and successful charity. He also bequeathed his books for a public library, but the books were subsequently lost. Johns died in 1721, having been the minister at Stroud for 33 years, and was buried in an alley near the nave. When the curacy became vacant in 1721, the old argument about whether the parishioners or the Bishop of Gloucester had the power of appointment broke out again. 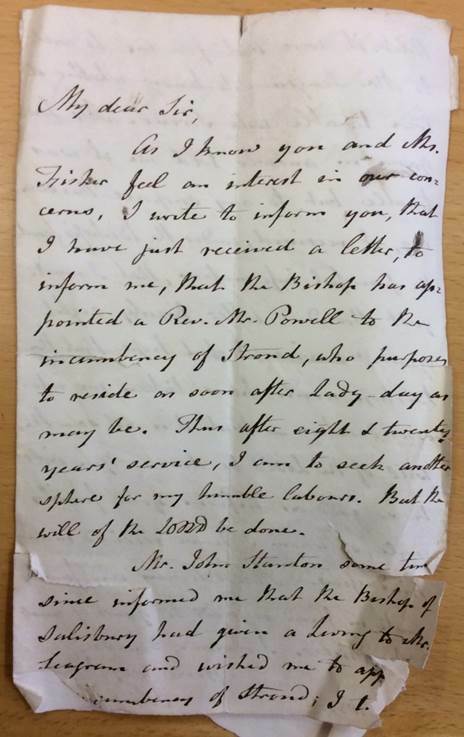 In 1722, Henry Bond was ‘appointed’ by some of the parishioners, and was subsequently licensed by the bishop. However, at the same time there was another candidate for the office, a Mr Bedford, who was supported by a majority of the parishioners and local landowners; but the bishop would not retrace Bond's appointment. Bond had powerful opponents in Giles Gardner of Stratford House, and William Capel, both churchwardens for several years, and both very influential people within the parish, and they withheld his £15 a year stipend. The dispute and ill-feeling rumbled on for many years, and it wasn’t until 1741 that the Lord Chancellor finally found in favour of Bond, and the church effectively became what is known as a ‘perpetual curacy’ subject to the nomination of the bishop. 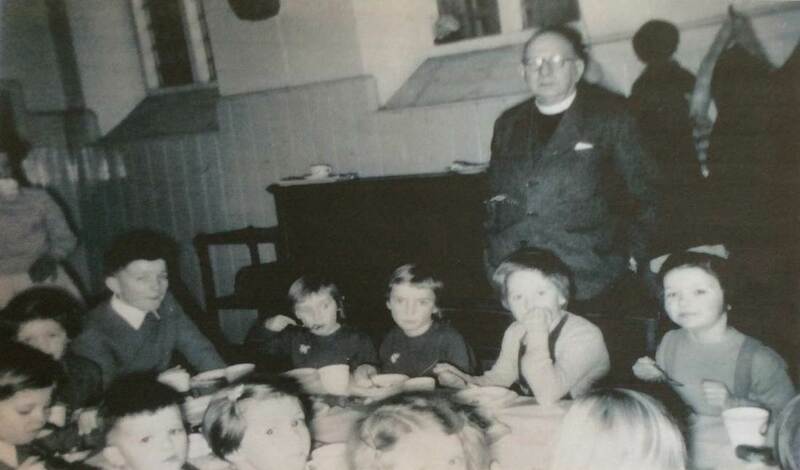 In spite of the controversy surrounding his appointment, the relationship between Bond and his parishioners became friendlier over time, and he was praised for his work in the parish, particularly for his interest in the conduct and improvement of the charity schools. Bond will also have been aware of a visit to Stroud by the preacher John Wesley in June 1742, when he preached a sermon in the nearby Shambles, where a plaque today commemorates how he made use of a butcher’s block to stand on as he preached. Among published works attributed to Bond are a sermon entitled, “A Legacy for a Careless World", with a preface on the evils of idleness, printed in 1739; and a pamphlet entitled, “A New Year’s Gift for the parishioners of the parish of Stroud”, printed in 1749, a miscellany of observations, instructions, proverbs and wise sayings. Bond died in 1757 at the age of 84, after having been minister for 35 years. He was buried at the church. Warren was educated at Christ Church in Oxford, and was ordained at St Peter’s in Westminster in 1755. In 1757, he was appointed perpetual curate of St Laurence. 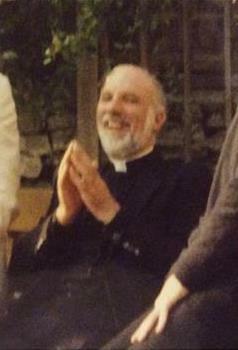 He also held many other posts during his years of ministry, including Vicar of Kempsford, Gloucestershire; Prependary of Gloucester Cathedral; Vicar of St Mary de Lode, Gloucester; Vicar and rector of Naunton, Gloucestershire; Rector of Kinwarton, with Great Alne and Weethley, Warwickshire; Rector of Ripple with Queenhill, Worcestershire; Rector of St Mary, Abchurch, with St Laurence, Pountney, London; and Archdeacon of Worcester Cathedral. Thursday 29th November 1759 was appointed General Thanksgiving Day on receipt of the news of the fall of Quebec, an an old newspaper report, quoted in “Gloucestershire Notes & Queries” magazine (1881), commented on the celebrations in Stroud: "We hear from Stroud-water in Gloucestershire (where a navigation is carrying on with great success), that on Thursday se'nnight [‘seven nights’], being the day appointed for a General Thanksgiving, it was observed there in the following manner: In the morning the gentlemen, clothiers, and chief in-habitants, met at the George Inn, from whence they walked in procession to the Church, drums beating, colours flying; and after hearing an excellent sermon preached by the Rev. Mr. John Warren, they returned to the George, where a handsome entertainment was provided; after dinner many loyal healths were drank, liquor given away, and the evening concluded with bell-ringing, illuminations, bonfires, and fireworks, played off in curious forms, to the satisfaction of great numbers of spectators." Warren died in 1787. Educated at Christ College in Cambridge, Webster was ordained at St Paul’s in London in 1758. He became vicar of Northleach with Ebrington in 1761, and curate at St Laurence in 1764. He later married a niece of Dr Warburton, Bishop of Gloucester, and as a result also obtained the vicarage of Much Cowarne in Herefordshire, the archdeaconry of Gloucester, and the rectory of Dursley. 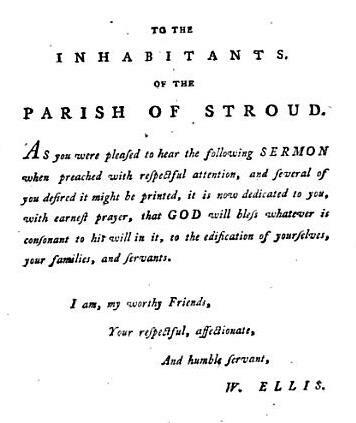 Webster was non-resident in Stroud for much of his curacy, so his officiating curate, William Ellis, effectively took charge of the parish. Webster died in Dursley in 1804. In consequence of the non-residence of James Webster, William Ellis more or less had sole charge of the parish for 32 years up until his death in 1804. He was educated at Pembroke College in Cambridge, and was ordained as a priest at Christchurch, Oxford, in 1771. He was said to have had a taste for music and drawing, but that he was colour-blind. His sight was also weak, and when the chancel of the church was rebuilt in 1789, its window was made particularly large in order that he would have enough light to read by. He was also described as a humourist and punster; it was said that at one meeting, when called upon for an after dinner toast, he proposed, “All people that on earth do dwell!” Ellis was praised for the interest he took in the local daily schools, and introduced Sunday Schools. On 29th July 1784, being thanksgiving day for the peace that followed the ending of the American War of Independence the previous year, Ellis preached a sermon entitled, “On the method of keeping the Sabbath day, and its rewards”, which was later printed and published for the benefit of his Sunday Schools. 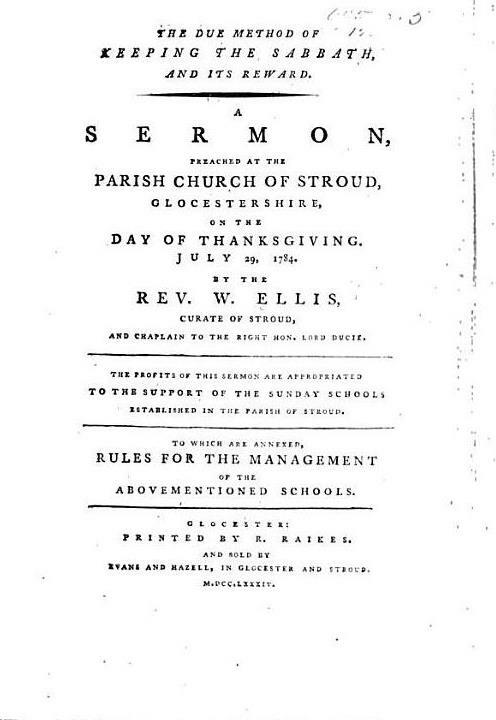 Appended to the printed sermon were “Rules for the management of the Sunday schools in the parish of Stroud”. He was also responsible for the first attempt at increasing reading in the Stroud area by the establishment of a Book Society in about 1790. With both James Webster, the non-resident curate of St Laurence, and his officiating curate William Ellis, both dying in 1804, John Seagram was appointed; though he, too, was non-resident during his tenure. Seagram was appointed by the bishop, and once again the old issue of whether the bishop or the parishioners had the right of appointment was argued over. Legal opinion was that the parishioners had the right, and that the bishop’s claim was based solely upon usurpation. However, in the end the parishioners decided not to pursue the matter. Seagram was educated at Exeter College, Oxford, and was ordained at New Windsor, Berkshire, in 1801. 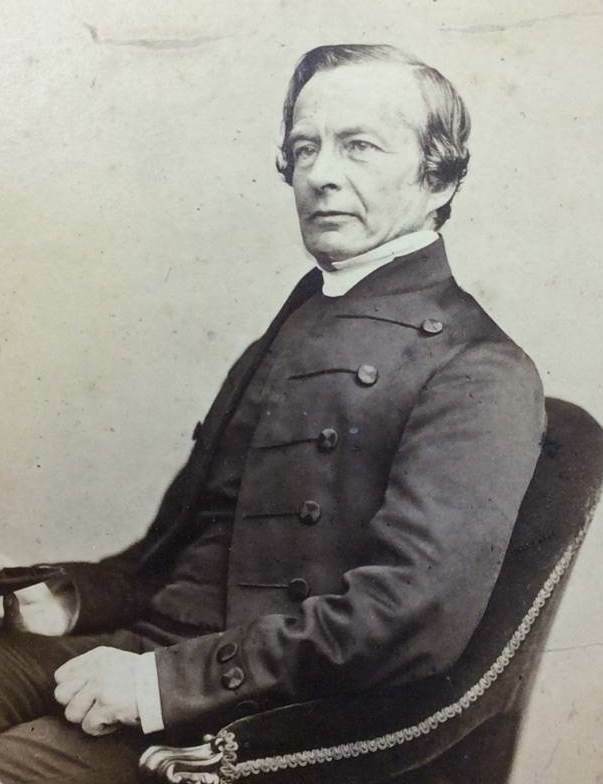 As was common at the time, he held a number of posts during his ministry, including: Curate of Sutton Veny, Wylye, Little Langford, and Fisherton-de-la-Mere (all in Wiltshire); Rector of Godmanston, Dorset; and Vicar of Aldbourne in Wiltshire, where he died in 1852, at the age of 79. There is a monument to him there in St Michael’s Church. He had three sons, all who had interesting lives: Henry Frowd Seagram was a captain in the Royal Navy, and Commander-in-Chief of The Gambia; Charles Seagram was a Colonel in the British Army; and Edgar Seagram died at the age of 19 on the ship ‘Lady Campbell’ when on the way to Madras as a cadet with the Honourable East India Company. Williams was a native of Sidmouth in Devon, but grew up in Plymouth. He preached his first sermon at St Laurence on 21st April 1805, using the words of St Paul: “I determined to know nothing among you, save Jesus Christ, and him crucified”, making a justification of grace through faith, and good works as the fruit and evidence of faith. It was said that Williams’ youthful enthusiasm, the spirituality of his views, and his earnestness of purpose, aroused immediate attention. Amongst his achievements during his time as officiating curate were: the starting a series of weekly evening meetings for prayer and understanding of the Scriptures, which he held in Paganhill, Limekilns, Thrupp and Stroud Hill; helping to establish the Stroud branch of the British and Foreign Bible Society; the establishment of an Auxiliary Church Missionary Society, and a Society for the Promotion of Christianity among the Jews; the introduction of a new collection of psalms and hymns; the opening of a boarding school and introduction of a new system of education for the poor; the founding of a new school at Thrupp; the education of local young men for the Church Missionary Institution; and the publication of several sermons and pieces of sacred poetry. In 1821, he was appointed to St Matthew’s in Liverpool, but Henry Ryder, Bishop of Gloucester, was unwilling to lose him from Stroud and persuaded him to turn down the position with the promise that he would be given the perpetual curacy of Stroud should it become free. Eventually, in early 1833 the curacy at St Laurence did become free, but by then Ryder was no longer bishop and the new bishop appointed William Frederick Powell instead, much against the wishes of the parishioners. 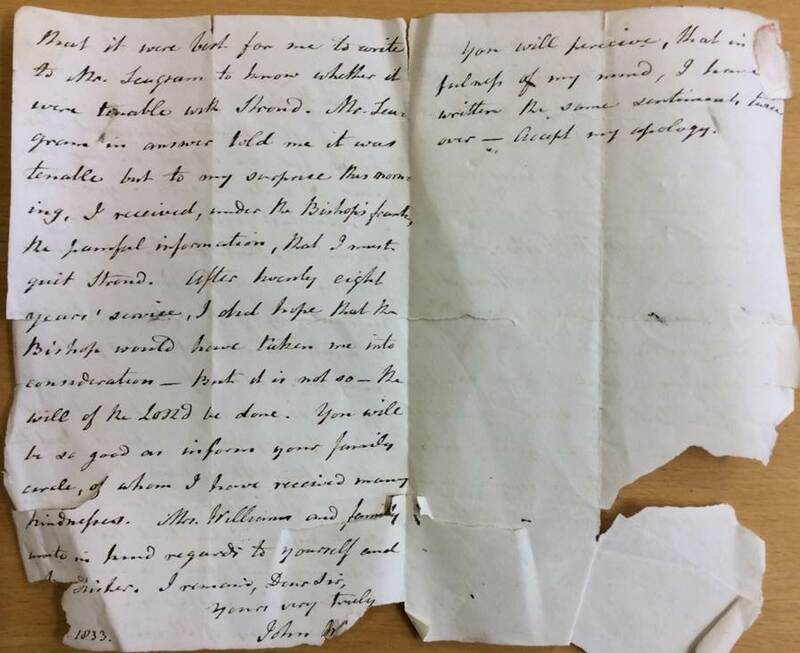 When Powell started his duties on Sunday 31st March 1833, Williams remained sadly at home for the first time in 28 years, with his wife who was unwell and anxious. However, that same afternoon he was visited by Henry Moreton, son of the Earl of Ducie, who immediately offered him the benefice of Woodchester. He was inducted at Woodchester on 13th April 1833, and remained there for a further 24 years until his death in 1857, at the age of 78. His remains were deposited in a vault at St Laurence. Williams was the maternal grandfather of the poet AE Housman. Powell was ordained at Hereford in 1827, and was curate at Great Malvern in Worcestershire before becoming curate of St Laurence. In 1839 he was appointed vicar of Cirencester, a post he held until 1868. He was also canon of Gloucester Cathedral between 1854 and 1881, canon of Hereford Cathedral between 1879 and 1880, and chaplain to The Duke of Sussex. 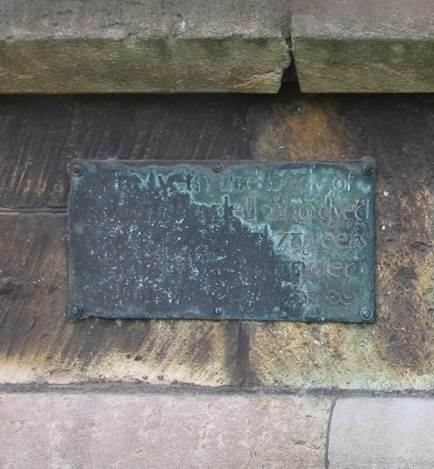 The foundation stone of the new church of Holy Trinity was laid during his incumbency, and hew was responsible for ensuring its completion in 1839. He died in 1890 at Hinton Court near Hereford. Holy Trinity Church, completed in 1839 under William Frederick Powell’s incumbency at St Laurence. 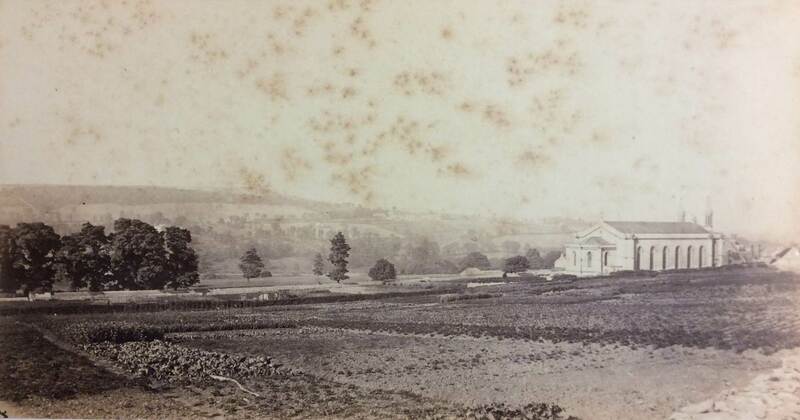 ​This early photograph of the church is by Oliver Claude Smith of Stroud, who was active from 1857 to 1889. Hale was born in 1811 at Alderley in Gloucestershire. Educated at Wotton-under-Edge, Gloucester School, and Trinity College, Cambridge, he was ordained in 1836 and became permanent curate of the church in 1839. However, the death of his wife, Sophia, and of his mother both in 1845 severely affected his health, and he resigned his post. Two years later, Augustus Short, Bishop of Adelaide, invited Hale to become archdeacon and examining chaplain for South Australia. Eager for missionary work among the Aboriginals, he accepted and on arrival in Australia he was given charge of St Matthew's in Kensington, and soon afterwards of St John's in Adelaide. Hale was subsequently appointed the first Bishop of Western Australia in 1857, and later Bishop of Brisbane. He finally retired in March 1885 and returned to England. He died in Bristol in 1895. George Proctor was born in Hertfordshire in 1809, and was educated at Christ’s College in Cambridge. He was ordained a deacon at Gloucester in 1835, and was curate of Attleborough in Norfolk between 1842 and 1843. In 1845 he was appointed curate at St Laurence. A stained glass window in Holy Trinity Church (consecrated in 1839) is “In memory of the Rev. George Proctor, for thirteen years pastor of the parish church, who died September 30th, 1858”. A further sepulchral inscription in the churchyard is to, “George Proctor xiii years Incumbent of Stroud, died Sept. 30, 1858, born March 18th, 1809. Blessed are the dead which die in the Lord.” George had three sons: George Vizard Proctor taught classics and mathematics at Radford House Private School in Exeter, before himself becoming a clergyman in Rayleigh, Essex; Frank Proctor was a civil engineer; and Henry Proctor was also later to be vicar of St Laurence. Thomas Henry Tarlton was born in Birmingham in about 1822. In 1856 he married Elizabeth Jane Tatham at St Mary’s in Great Malvern, Worcestershire. He was ordained a deacon at Gloucester and priest at Winchcombe, both in 1858, and then appointed curate at St Laurence. Sadly, his wife Elizabeth died that same year. A sepulchral inscription in the churchyard of Holy Trinity church reads, “Elizabeth Jane, wife of the Rev. T. H. Tarlton, incumbent of Stroud, born Aug. 13th, 1826, fell asleep Nov. 10, 1858. “Waiting for the coming of our Lord Jesus Christ.”” Thomas married his second wife, Sophia Augusta Cook, at East Peckham in 1860. He was later rector of St John’s in Horsleydown, Southwark, London (1866-1874), rector of Southam in Warwickshire (1877-1879), and rector of Lutterworth in Leicestershire (1879-1888). He died at Lutterworth in 1888. Badcock was born in Madron, Penzance, Cornwall in about 1808. Educated at Trinity College in Dublin, he was ordained in Lincoln in 1838. He was curate of Market Stainton with Donington on Bain between 1836 and 1837, curate in charge and lecturer of Louth between 1838 and 1842, and rector of Little Carlton and Castle Carlton between 1842 and 1845, all in Lincolnshire, where hew was also rural dean. He married Harriet Mary Chapman at Louth in Lincolnshire in 1846. He was curate at St Laurence from 1865, and oversaw the rebuilding of the church between 1866 and 1868. His wife Harriet died in 1868. A sepulchral inscription in the churchyard of Holy Trinity Church (consecrated in 1839) reads, “Sacred to the memory of Harriet Mary, the beloved wife of the Rev. John Badcock, L.L.D., incumbent of this church and parish. She fell asleep in Jesus Jany. 13, 1868 aged 42 years”. Badcock himself died in Stroud on 25th July 1885, and the window in the east wall of St Laurence, by the organ, is a memorial to him. 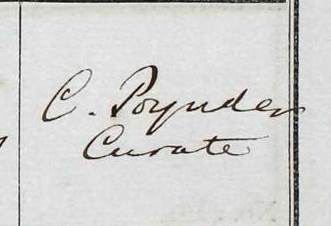 Poynder was born in 1835 at Barming Heath in Maidstone, where his father George was medical superintendent at the Kent County Lunatic Asylum. Educated at Blackheath Preparatory School in London, and Caius College, Cambridge, he was ordained in Manchester in 1860, and was curate at St Peter’s in Halliwell in Lancashire, and then at Leonard Stanley in Gloucestershire. By 1863 he was an assistant curate at St Laurence during the ministry of John Badcock, and that same year married Clara Mary Lloyd. Sadly, Clara died in September 1872, and Poynder left Stroud to become rector at Wick Rissington, near Stow-on-the-Wold, where he married his second wife, Elizabeth Favell Beddome in 1874. In later life he lived in Bristol, and was chaplain of Horfield Prison. He died in Bristol in 1929. D’Ombrain was from a family with Protestant Huguenot origins, and was born in Canterbury, Kent, in 1840, the son of William D’Ombrain, a hop farmer. In his school days at King’s School in Canterbury, he became a firm friend of Walter Pater, who was to become a celebrated English essayist, literary and art critic, and writer of fiction. In Thomas Wright’s biography, “The Life of Walter Pater”, published in London in 1907, there is a charming description of D’Ombrain in his schooldays: “In February, 1854, there entered the school a lad of solemn countenance and slightly saturnine disposition, named Henry Dombrain, son of Mr. William Dombrain …. hop grower and wine merchant, of Canterbury – a gentleman of Huguenot descent whose ancestors were said to have come over at the time of the persecutions in an open boat. A good-hearted but curiously narrow-minded boy, Dombrain – “Archdeacon Dombrain,” as the other boys called him – was a very Procrustes for expecting everybody else to conform to rules of which he himself approved; but he and Pater presently became bosom friends, and it was from the Dombrains that Peter obtained some of the material which he used many years after in his story of the Huguenot persecution – Gaston de Latour." Wright described D’Ombrain as “a diligent, if rather narrow-minded, clergyman, with a furious antipathy to Radicals and Nonconformists”. 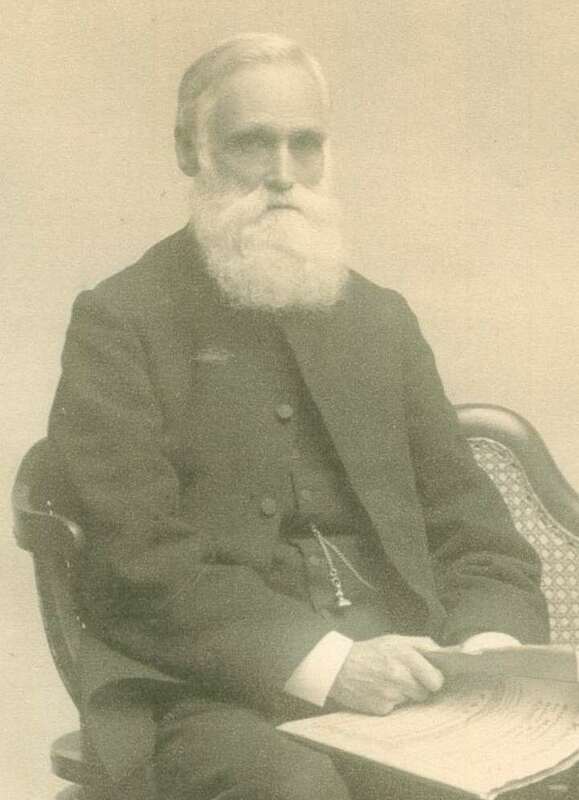 Dombrain took his degree in 1863 at Pembroke College, Oxford, became curate of Chippenham in Wiltshire early in 1864, and was vicar of Framilode in Gloucestershire between 1871 and 1885. He was vicar of St Laurence from 1885 until 1892, and married Julia Anne Bowles in Bath in 1886. D’Ombrain later retired to Clifton, near Bristol, and died on 2nd October 1896 at Barton Regis. He is buried at Framilode. Henry Proctor was the son of George Proctor, who had been curate at St Laurence over 50 years earlier. 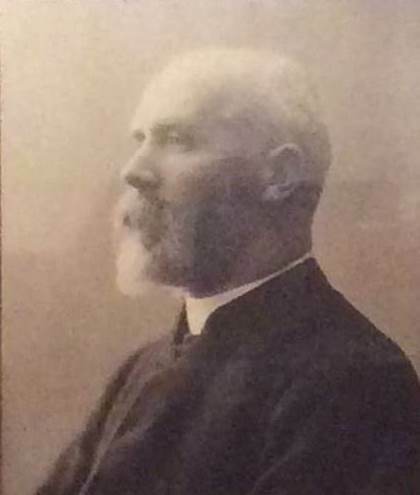 Born in Stroud in about 1852, he was vicar at St John’s in Newland, Under Principal at the Gloucester, Bristol and Oxford Diocesan Training College for Schoolmistresses at Fishponds, near Bristol, vicar at St Luke’s in Gloucester, and rector at Leckhampton, before becoming vicar at St Laurence in 1912. He was almost immediately embroiled in an extraordinary row when he asked for permission to place a pair of candlesticks on a ledge at the back of the altar, with an inscription around the base, “To the glory of God and in memory of the Reverend George Proctor [his father], incumbent of Stroud 1845-1858”. The application was opposed by a Mr Stuart, who claimed “that the placing of candle sticks on, near, or by the altar is unlawful as introducing altar lights and being symbolical, and as being, or leading to, and calculated or intended to lead to an illegal ceremonial use”, and “that the introduction of the candlesticks for lights is contrary to the teaching of the Homilies.” It was Proctor who, in 1912, bought Rodney House by the church, which was later bought from him by the diocese for use as the vicarage (today it is the Church Court Care Home). The nearby St Alban’s Church was the idea of Proctor, who was concerned about the large and growing population on Stroud Hill. Swayne was born in Mathon, Worcestershire, in about 1864, and educated at Keble College, Oxford, and Theological College, Ely, before becoming curate at St Martin’s in Scarborough, where he married Eva Margaret Kitson in 1897. He was later vicar of St Aidan’s at Potternewton, Leeds. He died at Llys Bach, Harlech, Wales in 1940. 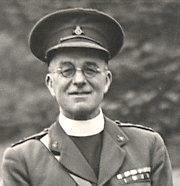 On 10 November 1930, Canon Helm’s wrote a letter to The Times regarding Remembrance Day: "To the Editor of the Times. Sir - One is indeed alarmed at the bare suggestion of the Bishop of Durham that Armistice Day should cease to be honoured as it has been in the past. The mere fact that in the very heart of our Empire the whole vast business of the Empire ceases for those two minutes, that in every far off archipelago, wherever the British flag flies, men and women observe that solemn silence, is ample proof of our determination as an Empire to pay some little tribute to the million dead who gave their life blood so generously. Any attempt to interfere with this sacred observance is bound to create bad feeling, as to millions those two minutes are precious words. I am, &c G F Helm, The Vicarage, Stroud Gloucesteshire"
Steer was born in Harborne, Birmingham, in 1883; his father Edward was the director of a steel and screw manufacturing company. Educated at Magdalen College, Oxford, and Cuddesdon Theological College near Oxford, Steer was ordained as a deacon in 1910, and was curate at St Matthew’s in Bethnal Green, London. 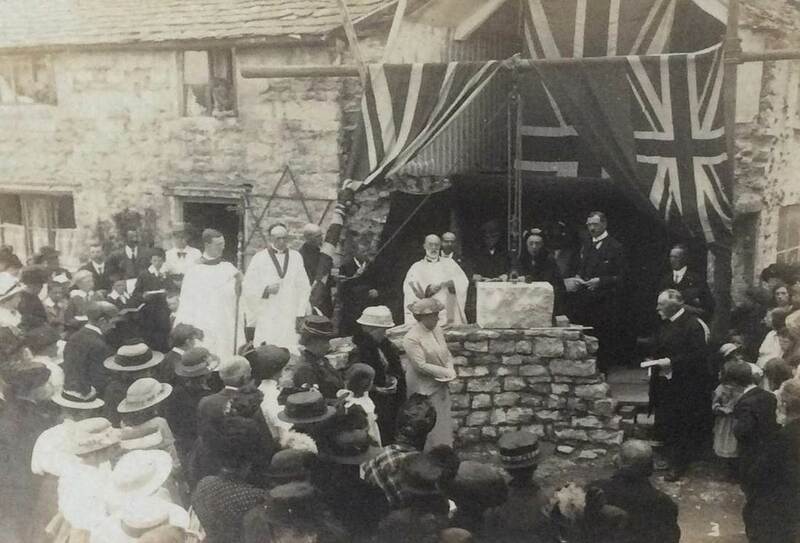 In 1911 he married Gertrude Esther Johnston in Headington, and was ordained as a priest, being curate at All Saints Southampton, then rural dean and vicar of Tidenham in the Forest of Dean. From 1930 to 1935 he was vicar at St Mary’s in Selly Oak, Birmingham, and rural dean of King’s Norton. He died in Abergavenny in 1953. From left to right - Back: Mrs Martin; Mrs D Wyatt; Mrs O Durn; Mrs C Cairn; Mrs Foster-Langley; Mrs E Smith; Rev K Williams; Mrs Pearce; Mrs Warner; Rev E Bartlett; Mrs Balderson; Mrs Townsend; Mrs Pritchard; Mrs Shipton; Mrs Ayson; Mrs Payne; ? 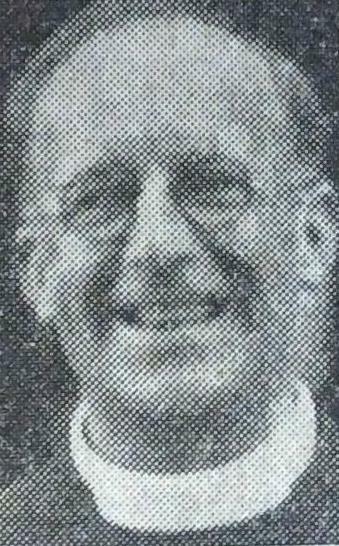 Maltin was vicar from 1950 until 1960, and was also vicar of Amberley. He was born in Bath in 1894, the son of William Henry Maltin, a tailor’s cutter, and grew up in Bristol where he was originally apprenticed into his father’s trade. However, on 15th January 1915 he set sail from London on the ship ‘Orsova’ for Brisbane in Australia, to study theology at St Francis College, Nundah, Queensland (now in Milton, Queensland). He became Captain of the Rifle Club at the college, and on 30th September 1916 enlisted in the Australian Army Medical Corp, embarking for overseas service at Sydney on 1st August 1917 on board the troopship HMAT Medic A7. But his active service was to be short lived. He was operated on for appendicitis whilst on board ship, but this was followed by a whole series of complications which meant a quick return to England and then months of hospital stays and light duties. He was finally discharged as medically unfit on 12th February 1919. By then he had married Ada Louisa Hitchins in Bristol in 1918. Maltin died in Exmoor, Somerset, in 1972. His son, Captain Michael Francis Aston Maltin DFC, was a World War II pilot of Spitfires and Lancaster bombers. Born in 1926, Peter Minall was vicar at St Laurence from 1969 to 1984. 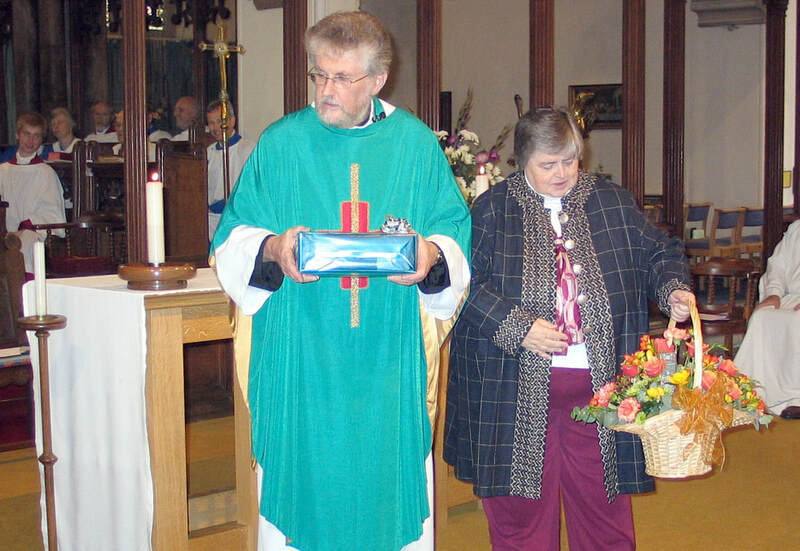 He was also rural dean of Bisley (1977-1984), and priest-in-charge of Barnwood from 1984 to 1991. Prior to joining the ministry in 1957, he was a BBC control room engineer, and had been involved in the broadcasting of the 1948 Olympics. 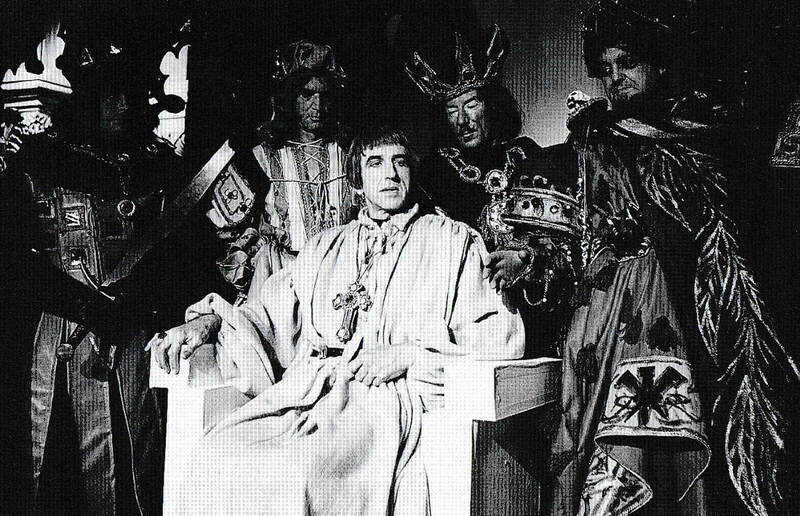 So he would have felt very comfortable on 3 September 1972 when BBC Radio 2’s Sunday Half Hour was broadcast from the church; and again in 21 September 1975, when his family communion service was broadcast as the Morning Service on BBC Radio 4. Later, on 17 April 1978, BBC 1’s Songs of Praise was recorded and broadcast from the church. Peter and his wife Jean moved to Painswick in 1991, before retiring to Quedgeley in 2012. Barry Charles Ellis Coker was appointed vicar at Stroud in 1990, overseeing worship at St Laurence, All Saints Parish Church in Uplands, and Holy Trinity Church in Slad, having relocated to Stroud from Matson near Gloucester, where he served as rector from 1978. Before that he presided over five congregations in Trinidad and Tobago for four years after studying overseas worship at college in Birmingham, where he first met his wife Barbara. From 1998 he was also honorary canon of Gloucester Cathedral.